In October/November 2017 I visited Southern Africa with visits to Malawi, Swaziland, and Moçambique (Mozambique). 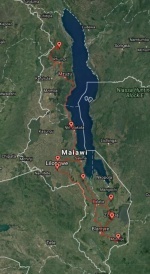 The tour in Malawi was organized by Ultimate Travel. Everything worked out very well, I was happy with the organization. I flew into Lilongwe International Airport, where representatives from Ultimate Travel picked me up. We drove to Lilongwe, about 32 km (20 miles), where I stayed the first night in the Korea Garden Lodge. That afternoon we visited a crafts market. 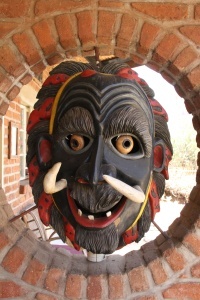 The main thing in Malawi seems to be wood carving. I saw nice wood carvings in many places. The next morning my guide for the trip picked me up, and we drove Mua, where I stayed for one night. The lodge there didn't have electricity and no running water because of the lack of power. The electricity came back on for a bit, but not the water. Otherwise, the lodge was nice, they had decent food. In Mua I visited a museum/shop with lots of wood carvings, some of them quite bizarre. Another small museum had a lot of information about the major local tribes in central Malawi, the Chewa, Ngoni, and Yao. The next day we drove north to the Nyika National Park, a drive of about 630 km (391 miles). Except for a stretch of about 20 km (12 miles) the paved road was very good. The last part was unpaved road, in pretty good condition. The Chelinda Lodge in the Nyika National Park was great. I stayed there for two nights. There are several separate cabins, each with a large room, a porch, a loft, and a large bathroom with a tub and a separate shower. The lodge is at 2,400 m (7,870 ft) altitude, so it was a bit chilly, especially at night. There was a fireplace in the cabin, and the room service started the fire in the evening, which was very nice. The food was very good. I had a walking excursion in the morning, and a game drive in the afternoon. On the walk I saw a lot of the local wildflowers. The most impressive sights were large herds of Eland antelopes, the largest of the antelopes. I had seen Eland a couple of times before, but only single antelopes. Here in Nyika there were herds as large as more than 100 Elands. During the game drive I saw one leopard. As far as large predators are concerned, throughout the trip I saw only this one leopard and a group of three lions in Liwonde. Altogether it was a very pleasant stay at the Chelinda Lodge. From Nyika National Park we drove back south to the Nkhotakota Wildlife Reserve, where I stayed at the Bua River Lodge for two nights. The accommodations at Bua River Lodge were very nice, permanent tents with comfortable beds, with adjoining bathroom and shower. The food again was very good. In the Nkhotakota Wildlife Reserve there are no game drives, only walking excursions. We didn't see much wildlife, other than birds. I did see elephants a couple of times and some crocodiles. As I understand it, they are trying to get more wildlife into the reserve, but that takes time. From the Nkhotakota Wildlife Reserve we drove further south to Mulanje, a drive of about 480 km (298 miles). I stayed at the CCAP House Likhubula at the bottom of Mount Mulanje. CCAP stands for Church of Central Africa Presbyterian. They didn't serve beer at the lodge, but had a fridge, so I bought some beer in Mulanje. A few weeks before my trip I received a notice from the US Consulate in Malawi, warning about attacks on and around Mount Mulanje. The attacks appeared to be motivated by a persistent rumor describing the potential for attacks by vampires or bloodsuckers in the area. I asked my tour organizer about it, but they said it would be no problem. He was right, I didn't see anything dangerous. On the full day there I hiked up Mount Mulanje, a 5 hour hike from 2,800 ft (850 m) to 5,800 ft (1,770 m). It was a great hike. From Mulanje we headed back north to Zomba, where I stayed for another two nights. This part of the trip was a bit disappointing, there is nothing really to see in Zomba. There is Williams Falls, a small waterfall, and Chingwe's Hole. The hole is said to lead to the bottom of the Rift Valley. In the past, local chiefs would throw their enemies into the hole. There is not really much to see. The city of Zomba has a nice looking university, but that is all there is in Zomba. It is not really worth a visit. From Zomba we headed further north to the Liwonde National Park, where I stayed two nights at the Mvuu Camp. I did a walking excursion there, a couple of boat tours and a couple of game drives. It is a very nice park. I did see lions in Liwonde, elephants, hippos, antelopes, and lots of birds. From Liwonde we headed back to Lilongwe for one last night in the Korea Garden Lodge. The next day I flew to Mozambique, via Johannesburg, South Africa. The lodges were all very nice, especially the Chelinda Lodge in Nyika National Park and the Mvuu Camp in Liwonde National Park. None of the accommodations had A/C, but it was no problem, it was not too hot. In fact it was pretty chilly in Nyika National Park. The Korea Garden Lodge in Lilongwe was 3*, pretty nice, the hotel in Zomba was basic but OK.
Food was mostly pretty good, but not remarkable. Beer was fairly inexpensive at $1.40 - $2.50 for 330 ml (11 oz). In the Mvuu Camp in the Liwonde National Park, the food was excellent. The roads in central Malawi were mostly good. In some areas, the side of the asphalt gets damaged by trucks and breaks off, narrowing the road. On the way north there was a stretch of about 20 km (12 miles) with extremely bad road, but it is being rebuilt (and widened in the process). There is a lot of police on the roads, including lots of speed traps. The police seems to be quite corrupt. If you were speeding, they let you go if you give them some money without receipt. Public transport is by the ubiquitous minibuses that you see everywhere in Africa. Truck traffic is heavy in a lot of areas, which is hard on the roads. There are very few motorcycles in Malawi, which I found quite surprising. My guide said that it is because of the high prices for motorcycles. The main mode of transportation is bicycles. With an extra seat in the back they are used as taxis, called Kabazas, everywhere in Malawi. Pictures of wildlife and birds are on separate pages.